If you want to make your home romantic and without a doubt stunningly in love,use these Red Rose Petals & achieve those things easy yet effective. 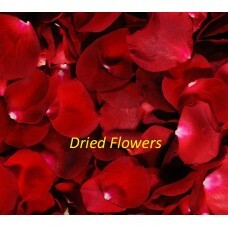 These dried and cut red rose petals can also be used to make aromatic pot-pourris & decorative bouquets. China Rose or Red Rose Petals can also be utilised as a vase filler to enhance the natural beauty of the container. If you want to make your home romantic and without a doubt stunningly in love,use these Red Rose Pet..